Imaro by Charles Saunders – A masterwork from the father of Sword and Soul. Imaro is the definition of great Heroic Fantasy. The Parable of the Sower by Octavia E. Butler – Widely considered Butler’s best work, this is an incredible story of a dystopian future and a heroine with hyper-empathy. Immortal by Valjeanne Jeffers – The first in a series of exciting books that takes place in the world of Tundra. Jeffers deftly combines Science Fiction, Horror and Romance in telling the story of Karla, a shapeshifter who fights the forces of evil of which she dreams. Wind Follower by Carole McDonnell – This epic fantasy romance explores race, ethnicity, and imperialism in a beautiful – and sometimes brutal – ancient African setting. A Darker Shade of Midnight by Lynn Emery – Mystery, Horror and Romance combine to give you this masterpiece that is a first in an incredible series. LaShaun Rousselle – the protagonist, who uses her paranormal abilities to solve the mystery of who killed her cousin and what lives in the woods on her family’s land – is one of the most interesting heroine’s in fiction. Order of the Seers by Cerece Rennie Murphy – This thrilling tale of discrimination, love, retribution, lust for power and the great potential that lies dormant in us all follows the life and struggle of Liam and Lilith Knight – a brother and sister duo who are hunted by a ruthless and corrupt branch of the U.N., which seeks to capture and exploit Lilith’s unique ability to envision the future. Hayward’s Reach by Thaddeus Howze – a series of short stories told by Mokoto, the last survivor of an unexpected cataclysm. Mokoto, even in his current state of in-humanity, learns what it means to be truly human. Steamfunk edited by Milton Davis and Balogun Ojetade – This is the definitive work of Steamfunk – a philosophy or style of writing that combines Black culture and approach to life with that of the steampunk philosophy and / or steampunk fiction – featuring fifteen masterfully crafted stories by fifteen amazing authors. Woman of the Woods by Milton Davis – A powerful Sword and Soul tale, set in Davis’ intriguing Uhuru universe, first experienced in his seminal series, Meji. Woman of the Woods draws us into the world of demon-hunter, Sadatina and her “sisters”, a duo of twin lionesses who aid her in her battle against the vicious Mosele and their demon allies, who seek to destroy her people. Redeemer by Balogun Ojetade – This is an edge-of-your-seat adventure that is both gangster saga and science fiction epic. A tale of fatherhood and of predestination versus predetermination. An entertaining mash-up that Science Fiction, Urban Fantasy and Urban Fiction fans alike will enjoy. If you are interested in finding more authors of Black Speculative Fiction check out Black Speculative Fiction Reviews. 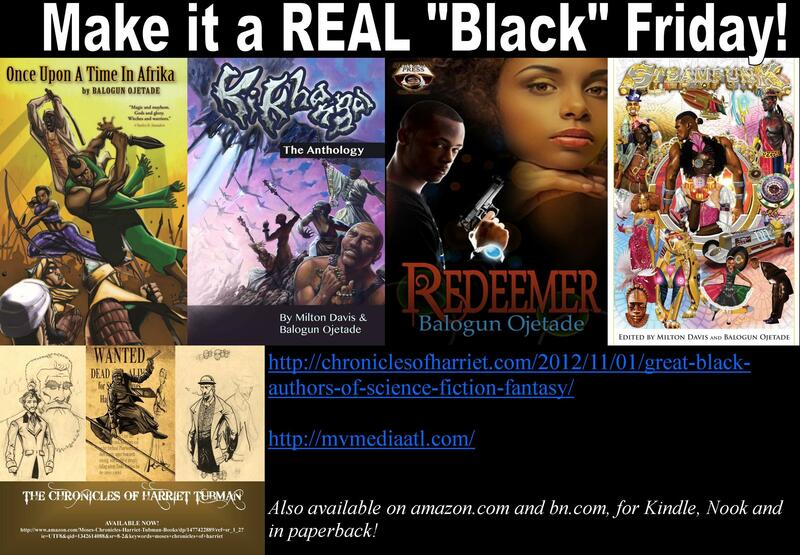 Posted by Balogun on November 29, 2013 in Adventure, Afrofuturism, Dark Fantasy, Dieselpunk, Fantasy, Harriet Tubman, Historical Fiction, Science Fiction, Speculative Fiction, Steamfunk, Steampunk, Street Lit, Supernatural, Thriller, Urban Fantasy, Urban Fiction and tagged afrofuturism, black science fiction, black speculative fiction, steamfunk, steampunk, sword and soul. That’s a helpful list to have. Thanks a lot for compiling it. I just wish that there were ebook versions of Charles Saunders’ books.